Cape Town – Four grenades lobbed their way, even before the game began ... all of them confidently grabbed, and hurled back with interest for a booming explosion at the other end. Imperiously overcoming a major quartet of reservations going into it, South Africa instead made a no-contest of their World Cup quarter-final against Sri Lanka at Sydney Cricket Ground on Wednesday, and in doing so re-announcing themselves as frontline contenders for the elusive trophy. The Proteas, absolutely reeking of intensity and dogged motivation from start to finish, rolled the ‘Lankans for 133 – hideously insufficient if Shane Warne’s stubborn theory of 280 as requirement on the surface was to be believed – and then knocked off the runs with all of nine wickets and 32 overs to spare. 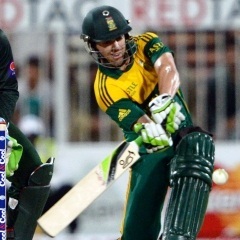 “That was the perfect performance,” stated even that tough taskmaster and former national captain Kepler Wessels from the SuperSport studio, as AB de Villiers’s side enjoyed the luxury of being the first team safely installed in the semis and able to spend the next few days watching the ups and downs (might we expect some closer contests?) of the remaining three matches in the phase. So what were the four critical boxes that needed ticking by South Africa for a clash widely expected beforehand to be too tight to call? The first and most obvious one was the truly big monkey on the back: the uncomfortable knowledge that the Proteas had never previously won a CWC knockout match, even if they have been semi-finalists three times previously (1992, 1999 and 2007) in days when the format was different. That once-tenacious primate has now not so much been brushed off as tossed into the deep undergrowth in terror. The next was the understandable fear that the modern SA side, with its reputation as “bat-first bullies” but perceived frail-hearts on the chase, might see a spectacular downgrading of their chances at the SCG if the Sri Lankans got first opportunity to take guard. They did, and with it many Proteas enthusiasts back home would have nervously spilt the milk intended for their early morning coffees at telly-side. But again, such paranoia proved notably unnecessary; Hashim Amla quickly set the tone in the reply as he smashed Lasith Malinga’s opening delivery to the ropes and somehow from there, you always felt a significant wobbly was highly unlikely to take root. The third major uncertainty was over the issue, vexing for some time, of the balance of the Proteas’ combination: would they go batting-heavy for the quarter-final, or bowler-laden ... or would they opt for the “meet halfway” kind of option once more in Farhaan Behardien? They went with Option A, thus saddling JP Duminy with dedicated fifth-bowler responsibility, and much to the credit of coach Russell Domingo and others close to him strategically, the plan worked a delicious treat. Duminy, who ended up sharing seven mid- to late-innings wickets with ever-incisive tweaking ally Imran Tahir, not only banished the fear that he would be severely challenged in the economy department – he went for a miserly 3.22 in his nine overs – but earned the tell-the-grandchildren-one-day feat of becoming only the second spinners to land a hat-trick in World Cup history behind Saqlain Mushtaq of Pakistan (against Zimbabwe at The Oval in 1999). Until Wednesday, Duminy’s bowling performance at the tournament had been indifferent, by the little off-spinner’s own later admission, but neutral television commentator Mark Nicholas rightly lauded him for quickly sensing the nature of the SCG strip by sending down the majority of his deliveries “fuller and slower” rather than in the flatter, quicker mode of recent matches which can sometimes also reveal hints of low confidence. With Duminy and Tahir in their element to an extent they may not have imagined against these normally so spin-wise opponents, there was also no respite for Sri Lanka against pace as Dale Steyn, Morne Morkel and Kyle Abbott (another astute pick on the day) bristled with controlled aggression. As if to put the cherry on top of this nirvana-like display, a fourth area of pre-quarters concern – the recent batting struggle of wunderkind Quinton de Kock – was also able to be banished to the bottom drawer. Showing a significantly restored sense of balance and timing at the crease, the left-handed opener punched his way to a fearless unbeaten 78 off 57 balls to ensure the crazily early -- not much after twilight in New South Wales -- finish. As indicated by Sport24 earlier this week, the Highveld Lions favourite already has a healthy track record in his fledgling top-flight career for forceful bounce-backs from spells of personal uncertainty – here was just another. “We really wanted to win today; we were almost obsessed with the goal,” confessed De Villiers in the immediate post-match interview, no doubt tickled pink by the outcome after making some unusually bullish statements in the build-up but then seeing his players so gladdeningly back him up.